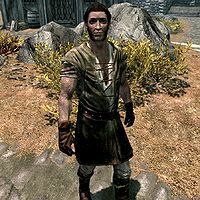 Belethor is a Breton pawnbroker and also the owner of Belethor's General Goods in Whiterun. As a general merchant, he buys and sells almost everything, and with everything, he really means everything: "Everything's for sale my friend. Everything. If I had a sister I'd sell her in a second." and "I'd even buy one of your relatives, if you're looking to sell. Ha ha ha ha. That's a little joke." Belethor lives the life of a busy merchant and therefore spends much of his time running his store. He wakes up at 8am and immediately opens up the shop for business. He can be found behind the counter inside the shop for the next twelve hours, offering his services to any potential customers. At 8pm, he leaves his shop to begin a four-hour stroll around Whiterun. From his shop, he heads west toward the main gate to Whiterun. Once he reaches the intersection before the Guard Barracks by the gate, he turns right and heads north up the steps to reach the Wind District. He will walk past Amren's house and House Gray-Mane to eventually reach the Gildergreen. At this point, he will head down the steps to the south to reach the market stalls in the Plains District and he will eventually reach the starting point of his stroll around Whiterun, his store. He will repeat this route until midnight, when he returns to his store, heads upstairs to his bed, and sleeps for the next eight hours. Belethor wears a set of farm clothes, a pair of boots, and a pair of gloves. He is equipped with an iron dagger, and carries a key to his store, as well as a selection of common loot and gold. If you ask him what brings him, a Breton, to Skyrim, a sarcastic Belethor will reply: "Isn't it obvious? Why, the wonderful weather and hospitable people, of course! Not to mention my great fondness for dragons and petty political power struggles. Ah, but without a doubt, the most compelling feature of this frozen wasteland is the volley of inane questions leveled at me on a regular basis." If you ask about his business, he will say: "Interesting, to say the least. What with all that's been going on. On the one hand, supplies are harder to come by, since fewer traders are traveling the roads these days. But on the other, the scarcity of supplies has led to some, well, 'elevated' prices. All that matters is that I have what you need. And it's worth every septim." After the siege on Whiterun, you may ask him about his business again. Belethor will again reply with sarcasm: "Oh no, not at all. I simply locked the doors, hid beneath my counter and prayed to the Divines that my life would be spared and my shop wouldn't burn to the ground. But other than that, everything was business as usual. Now, do you have any other painfully obvious things to say?" Occasionally, Belethor will display a blank inventory with neither the option to buy or sell. It is not known what causes this and the bug is permanent once it occurs. Belethor's shop will often close the moment you leave no matter what the hour, and may not reopen until after his inventory resets. This can be particularly annoying if you buy a high gold item intending to return with goods to trade the same day. Similarly, you may not be able to return to acquire an item seen before the reset occurs if you leave to get goods to trade. The standard wait for reset often results in his shop still being closed regardless of the time of day. Waiting nearby in one-hour increments may fix this. Belethor may continue to sell items normally if you pick the lock during business hours. Enter the console command prid 1a672 followed by resetai. This may take a few seconds to take effect. Ysolda was intended to take over Belethor's duties if he was killed, but she may not. Belethor is mistakenly referred to as a Wood Elf by the Official Game Guide. This page was last modified on 1 April 2018, at 03:38.